Designed for buyers and sales teams alike. Visualise collection information, enable the latest information to reach customers quickly and facilitate a smooth wholesale sell-in process. Your digital showroom solution. Designed for buyers and sales teams alike. Visualise collection information, enable the latest information to reach customers quickly and facilitate a smooth wholesale sell-in process. A new benchmark for fashion wholesale. Our digital showroom solution transforms your wholesale experience. Our 3D software allows teams from every department to interact with realistic renderings of your collection. Go further with our innovative solutions and raise the bar of your wholesale and retail presentations. All your product data is highly visual. Plan, manage and execute better collections. Get more results, take less time and reduce cost. Conceptualise your range with actionable and deeply integrated product data. Cloud-based technology allows access to resources and overviews wherever you are. Effortlessly create and share storyboards to preview products and range. Capture product images via any smart device and immediately update your pre-buying overview. Shorten your wholesale sell-in process. Present instant, visual collection overviews to your shop-in-shop and branding space clients on 3D fixtures. 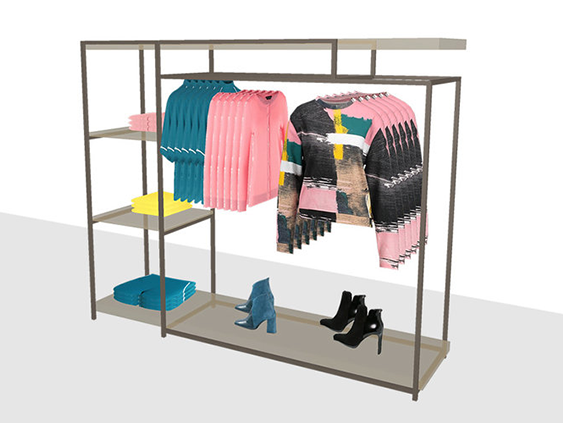 Digitally view every single item in the collection and create custom product catalogues with ease. Get instant access to information via our cloud-based application. Our 3D software allows teams from every department to interact with realistic renderings of your collection. Go further with our innovative solutions and raise the bar of your wholesale and retail presentations. Want to see it in action without having to travel? We’d love to run you through how this software works. Enter your email address to stay informed about the latest retail technology, software and systems.